Hi Friends: I created an ATC for Halloween - it was lots of fun to get out my sprays and pastes and make this little gem. Please see below for photos, process, challenges, and supplies. Have a super scary day! I recycled a piece of cardboard packaging for my ATC and prepped it with black gesso. I don't have a spider web stencil, so I used the Treads stencil from Tim Holtz because it looked almost web-like, and added texture using black molding paste. Once dry, I added some cheesecloth, then sprayed the ATC with the LSG purple spray, then added the spider glitter tape and the spider adornment. 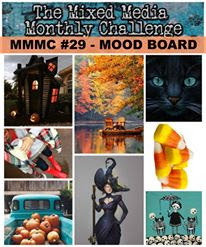 I added the moon in the top right corner using a Halloween themed sticky rub-on and orange glitter. I cut the skeleton picture from the Midnight Magic paper pad, and added it to the ATC. I covered the skeleton with crackle paint and crazing medium to get it to look like old, cracked picture glass. I added the glitter frame over the picture, then toned down the bright silver by painting it with the black LSG spray. 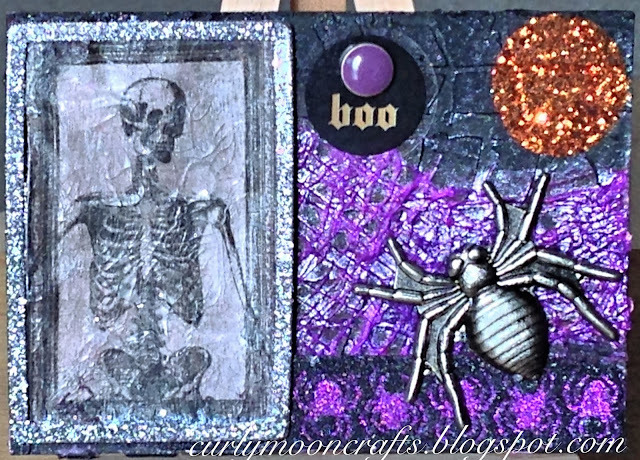 I finished off the ATC with the transparency "boo" tag attached with a purple brad. wicked fun and funky atcs!! Thank you for playing along with us at simon says stamp wednesday challenge! !